The autonomous Linde L-MATIC AC pallet stacker with cantilevered forks simplifies transport of closed carriers and the receipt of goods at transfer stations which are not accessible with load wheel supports, for example on conveyor systems. The counterbalanced truck, which can also be operated manually at any time, can handle loads of up to 1200 kilograms and lifting heights of 1.9 meters. It can be used individually or integrated as part of an automated fleet. The intelligent navigational system functions without the addition of tracks in the floor or laser reflectors. The L-MATIC AC can therefore be used flexibly, in a wide variety of different environments or in environments which change frequently. Its comprehensive suite of safety features reliably perceives people and obstacles in its area of operation. 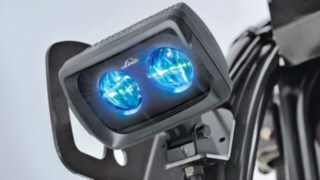 Thanks to the lasers and cameras used in its safety equipment, the Linde L-MATIC AC monitors its working environment and independently reacts to people and obstacles. When an obstacle is recognized, the truck reduces its speed accordingly, and will come to a halt if the obstacle does not move out of the way. This functionality simultaneously guarantees high levels of both safety and productivity. The L-MATIC AC can also be stopped at any time using any of several emergency stop buttons mounted around its frame. Warning sounds and flashing lights round out the robotic truck’s safety design. Should the truck need to be moved out of a hazardous area in an emergency, it can be controlled manually at any time using the drawbar. The autonomous pallet stacker interacts with other automated facilities, such as doors and roller conveyors, and can be used for the automation of repetitive working processes either individually or as part of a fleet. Routing and job allocation are controlled by the supervisor software. Via the system, driving tasks can be set directly from the warehouse management or ERP system. The innovative navigation technology allows MATIC trucks to get to work in a new or changing working environment within a short time. Thanks to its highly developed safety technology, the L-MATIC AC anticipates and reacts to obstacles, and automatically resumes its task when the person or other truck is no longer in its monitoring zone. In mixed work processes, the truck assists people in their work without safety restrictions. Due to the specially developed networking of the truck’s control systems, all of the L-MATIC AC’s data can be read on a service laptop. It is also possible to monitor the pallet stacker via a remote diagnostic system. The truck offers high operational availability, since all of its electronic and mechanical components are easily accessible, and the drive motor uses maintenance-free three-phase technology. The L-MATIC AC’s operational readiness is therefore guaranteed for a long time. The L-MATIC AC is delivered with two types of fork. Along with the standard 1000 millimeter fork, there is also one with a depth of 1100 millimeters. The L-MATIC AC can be delivered with an additional 2D curtain laser, which bolsters its scanning of its environment for safety purposes. 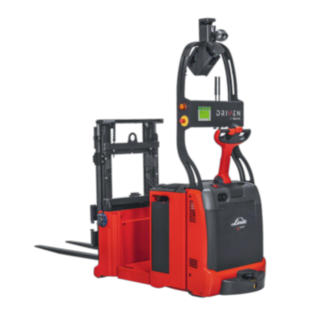 There is a three-meter extension cord for the pallet stacker, facilitating battery charging. The L-MATIC AC can optionally be equipped with an ancillary horn. This ensures that the pallet stacker is able to be heard more easily in particularly noisy environments.